Elizabeth Smart speaks during a news conference while her father, Ed Smart, looks on in Salt Lake City, Sept. 13, 2018. Elizabeth Smart said Thursday the news that one of her kidnappers will be released from prison next week was "a big shock," and she hopes there is a way the woman can be committed to a treatment facility since there is no legal recourse to keep her behind bars. 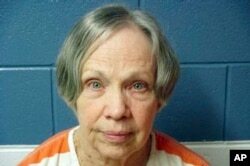 FILE - This April 8, 2016, file photo, provided by Utah State Prison shows Wanda Barzee. Her father, Ed Smart, also questioned why authorities didn't give her more warning about the impending release.